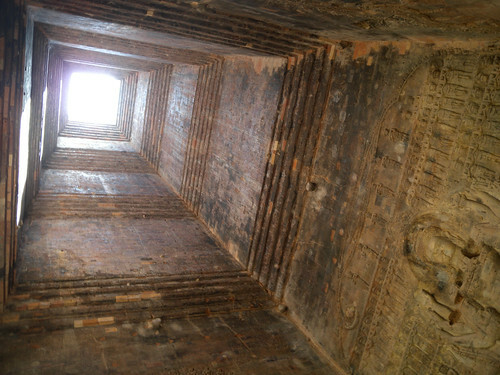 Prasat Kravan (Khmer: ប្រាសាទក្រវាន់) is a small 10th-century temple consisting of five reddish brick towers on a common terrace, located at Angkor, Cambodia south of the artificial lake or baray called Srah Srang. Its original Sanskrit name is unknown. The modern name in Khmer, "Prasat Kravan", means artabotrys odoratissimus temple. The temple was dedicated to Vishnu in 921 CE, according to an inscription on doorjambs. The site was cleaned from vegetation in the 1930s by Henri Marchal and Georges Trouvè. Afterwards the towers were restored on Bernard Philippe Groslier's initiative from 1962 to 1966, adding some new bricks which are marked with a "CA" (meaning "Conservation Angkor").